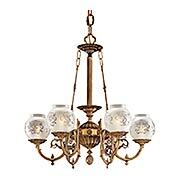 This lovely 3 light chandelier captures the lush, decorative style of the 1890s. Adorned with graceful ivy armbacks, twisted rope tubing and wreath-shaped gas keys, it's a period-perfect choice for a Victorian dining room or parlor. 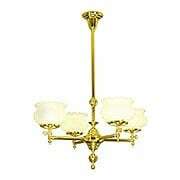 Each fixture is solid brass, hand-assembled in the USA. 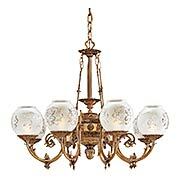 This lovely 5 light chandelier captures the lush, decorative style of the 1890s. Adorned with graceful ivy armbacks, twisted rope tubing and wreath-shaped gas keys, it's a period-perfect choice for a Victorian dining room or parlor. 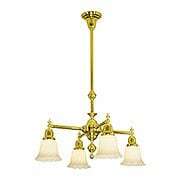 Each fixture is solid brass, hand-assembled in the USA. 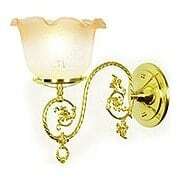 This lovely gas-light sconce captures the lush, decorative style of the 1890s. Adorned with graceful ivy armbacks, twisted rope tubing and a wreath-shaped gas key, it's a period-perfect choice for a Victorian dining room or parlor. 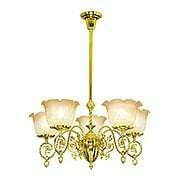 Each fixture is solid brass, hand-assembled in the USA. 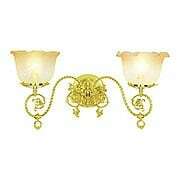 This lovely gas-light sconce captures the lush, decorative style of the 1890s. Adorned with graceful ivy armbacks, twisted rope tubing and wreath-shaped gas keys, it's a period-perfect choice for a Victorian dining room or parlor. 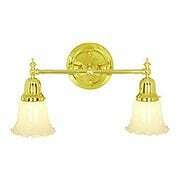 Each fixture is solid brass, hand-assembled in the USA. Plain-spoken, with just a hint of fancy, the Albany collection is suited to every room in the house. 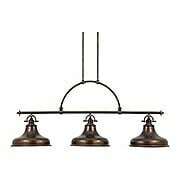 With it's straight tubing, simple lines and minimal decorative detail, this 4-light chandelier is equally at home in the dining room, kitchen or game room. Solid brass, hand-made in the USA. Plain-spoken, with just a hint of fancy, the Albany collection is suited to every room in the house. With it's straight tubing, simple lines and minimal decorative detail, this 4-light chandelier is equally at home in the dining room, kitchen or library. Solid brass, hand-made in the USA. Plain-spoken, with just a hint of fancy, the Albany collection is suited to every room in the house. With it's straight tubing, simple lines and minimal decorative detail, this double electric sconce is a favorite for the kitchen or bath. Solid brass, hand-made in the USA. This lavish, solid brass chandelier shows the French influence on 18th Century Georgian design. 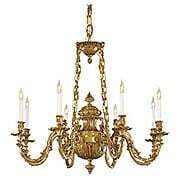 The heft and scale is strictly English, while the rich and varied natural ornament is pure Rococo. Perfectly proportioned and wonderfully decorative, it's a distinctive choice for any classical interior. 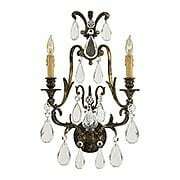 Capture the flavor of Victorian England with this handsome 8 light chandelier. Grandly scaled for large interiors, it features substantial cast brass elements and exquisite decorative detail. 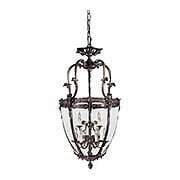 A subtle antique patina and etched glass bowl shades create the perfect period effect. Capture the flavor of Victorian England with this handsome 6 light chandelier. 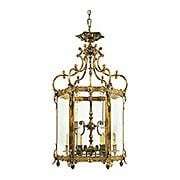 Grandly scaled for large interiors, it features substantial cast brass elements and exquisite decorative detail. A subtle antique patina and etched glass bowl shades create the perfect period effect. Genuine art glass in shades of crimson, saffron, sapphire and emerald will set your room ablaze with rich color! Handcrafted in iron with a deep bronze finish, this intricate Edwardian design gives any room an instant focal point. 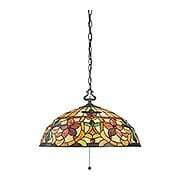 Tiffany Studio's fabulous stained glass inspired this lovely Victorian style pendant. The classic floral pattern shade is hand-crafted from genuine art glass in shades of yellow, orange and cream, accented with amber flowers and green leaves. Set into a delicate, bronze finished framework, the effect is magical. 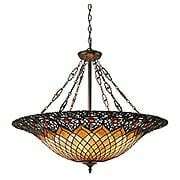 Lacy and graceful as a Victorian parasol, this large art glass pendant is a gracious addition to your dining room, foyer or kitchen. The beguiling design is distinguished by the filigree frame studded with scarlet blossoms and the uniquely bejeweled chain. Lit or not, it's pure magic! This airy Art Nouveau pendant is one of the most unusual and exciting lights we've ever come across. The simple cone shade is encircled by a web of arched wires, creating the illusion of a bowl-shaped fixture. Connecting panes of clear, granite glass add to the multi-dimensional effect. This metal-shaded Emery 1-Light Pendant is an elegant nod to the past. The classic Americana styling adds a nostalgic flair to your home. When hung over a kitchen island or dinette table it provides ample lighting for all your daily tasks. It is available in three fabulous finishes. This metal-shaded Emery 3-Light Island Chandelier is an elegant nod to the past. The classic Americana styling adds a nostalgic flair to your home. When hung over a kitchen island or dinette table it provides ample lighting for all your daily tasks. It is available in three fabulous finishes. 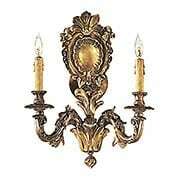 Our Venetian Premium Sconce in Antique-Bronze captures the delicate and elegant style of 18th-Century Venice. Full of graceful curves, flowers and vines, it is a gracious addiition to any room. 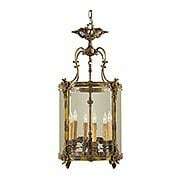 The exquisite castings are solid brass, finished in a mock antique bronze. Dripping wax candle sleeves add a romantic period touch to this fanciful Rococo design. Hand-crafted in Italy. 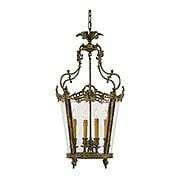 Our Venetian Premium Lantern in Antique-Bronze captures the delicate and elegant style of 18th-Century Venice. Full of graceful curves, flowers and vines, it is a gracious addiition to any room. 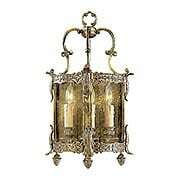 The exquisite castings are solid brass, finished in a mock antique bronze. Dripping wax candle sleeves add a romantic period touch to this fanciful Rococo design. Hand-crafted in Italy. The fanciful Rococo-style Venetian Premium 6-Light Pendant captures the delicate and elegant style of 18th-Century Venice. Full of graceful curves, flowers and vines, it is a gracious addition to your foyer or gallery. The strap frame and exquisite castings are solid brass, finished in a mock antique bronze. The fanciful Rococo-style Venetian Premium 9-Light Pendant captures the delicate and elegant style of 18th-Century Venice. Full of graceful curves, flowers and vines, it is a gracious addition to your foyer or gallery. The strap frame and exquisite castings are solid brass, finished in a mock antique bronze. The fanciful Rococo-style Venetian Premium Pendant captures the delicate and elegant style of 18th-Century Venice. Full of graceful curves, flowers and vines, it is a gracious addition to your foyer or gallery. The strap frame and exquisite castings are solid brass, finished in a mock antique bronze. Grand in scale, yet delicate in form, this spectacular four light pendant recalls the decorative Rococo style of 18th Century Germany. Over 30" in height, it's perfectly proportioned for a two-story foyer or over your dining room table. 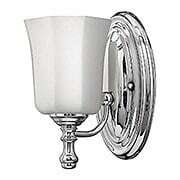 Sparkling with elegant pear-shaped crystals, this French-style sconce adds European glamour to your home. The antiqued and dripping candles, together with the bronze finished frame, create a romantic period ambience. The Shelly is one of our most versatile lighting families. 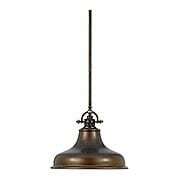 With its simple oval back plate, turned finial and six-sided opal glass shade, it feels right at home in Victorian, Colonial Revival and even Craftsman style interiors. May be installed with shade up or down. 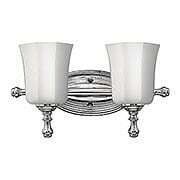 The Shelly Double Sconce is one of our most versatile fixtures. With its simple oval back plate, turned finials, and six-sided opal glass shades, it feels right at home in Victorian, Colonial-Revival and even Craftsman style interiors. May be installed with shades up or down. 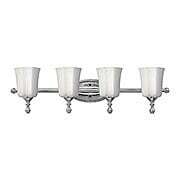 The Shelly Triple Sconce is one of our most versatile fixtures. 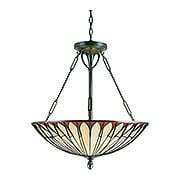 With its simple oval back plate, turned finials, and six-sided opal glass shades, it feels right at home in Victorian, Colonial-Revival and even Craftsman style interiors. May be installed with shades up or down. The Shelly 4-Light Sconce is one of our most versatile fixtures. 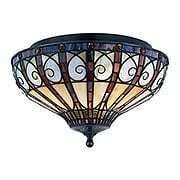 With its simple oval back plate, turned finials, and six-sided opal glass shades, it feels right at home in Victorian, Colonial-Revival and even Craftsman style interiors. May be installed with shades up or down. 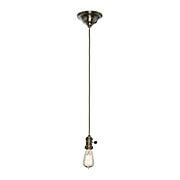 Utilitarian, yet stylish - our bare bulb pendant takes this turn-of-the-century design to new heights. The exposed socket is finely detailed and crafted from solid brass, providing a fitting compliment to a classic Edison style bulb (included). Cloth cord and a matching brass canopy complete the authentic look. Inspired by an early 1900s bracket light, our Tritan collection brings vintage American style to your kitchen or bath. 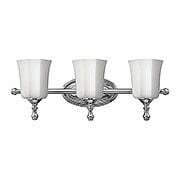 The classic, colonial-revival design comes in 2, 3 and 4 light versions. 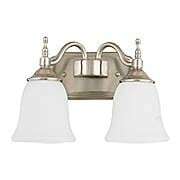 Installed over the kitchen sink or vanity, they provide ample lighting for all your daily tasks.